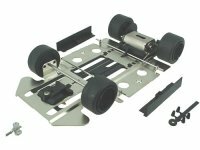 T24002 - 1/24 Scale Ready-To-Race Chassis [T24002] - $59.95 : TSR Slot Cars, TSR Slot Cars - Dedicated to Slot Car racing, collecting, restoration, track design, electronics and software. 1/24-Scale Home-Racing Chassis in Ready-to-Race form For Use on Carrera, Revell, Monogram, Atlas and most 3.5" lane-spaced plastic tracks. One traction magnet is supplied with each car and its use is recommended with stock tires. The use of a 2-amp variable voltage power supply and PM electronic controllers is highly recommended (please check our controller catalog). The chassis comes with 2 types of body mounts. We recommend the use of the Automatic Body Mounting Tool, part # T2407 when using the pin-tubing mounts. The chassis is fitted with the TSC25 guide pin. The cars are supplied with Gevon rubber tires suitable for plastic tracks for use with traction magnet. If used without a traction magnet, we recommend the use of THP2407 or THP2408 rear tires.